These days when the Constitution is mentioned, it is usually with regard to reform or to changes which must be made. Our current Constitution is 75 years old this year and it has been recognised that many aspects of it are now outdated and in need of modernisation. 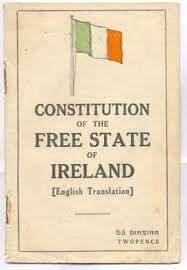 However, many provisions in the current document are actually much older than that, in fact, much of the 1937 Constitution is made up of provisions from the first Constitution of the modern Irish State – the 1922 Constitution, making those provisions 90 years old. The 1922 Constitution is not something people generally know very much about and much of what has been written on the topic has been quite negative. This is because of the controversial provisions which were inserted at the insistence of the British, provisions like the oath of faithfulness to the King and the Appeal to the Privy Council. However, those provisions were mostly meaningless in reality and by concentrating on those trivial provisions, the remarkable aspects of the 1922 Constitution have been overlooked. When the Constitution Committee of 1922 sat down to draft a Constitution for the embryonic Irish State, they had a blank slate with which to work. They decided to make a break with the past and to design a uniquely Irish document. They decided that the ultimate power in the State should rest with the people – this idea became the cornerstone of the document. In order to further that aim, popular sovereignty was proclaimed and ideas such as direct democracy were introduced; the people had the power to hold referendums on legislation and to propose legislation and constitutional amendments themselves. Another aspect to this idea of ensuring that all power would lie with the people, was to suppress party-politics so that the Parliament would truly be responsible to the people and not to political parties. Thus experiments such as the external ministers, functional and vocational councils, PR-STV and the original Seanad as a house of independent thinkers, were all included. However, due to the Civil War legacy in existence in Ireland at the time, the focus on keeping the peace and balancing the books and the strengthening of party politics with the emergence of Fianna Fáil in 1932, many of these innovative provisions were removed from the Constitution and some were never even used. Thus, the Constitution never had a chance to function as originally intended and the original spirit of the document was forgotten. Despite this however, the 1937 Constitution retained and reused most of its predecessor – certain provisions were taken out and some new provisions were added but as the late Dr Garret Fitzgerald has also commented; most of our current Constitution is in fact the Constitution of 1922. This is a remarkable fact and demonstrates the prescience of those involved in 1922. The aims which the 1922 Constitution attempted to achieve – more power for the people, responsibility of Government and Parliament – are still being sought today. We have yet to discover how to effectively achieve these aims but perhaps we can still learn from this 90 year old document by taking a closer look at the innovative provisions; at the ideals behind them and at the forces which prevented them from working. In this era of constitutional reform, perhaps some of the answers may lie in the past.